If you’re excited by the progress being made to restore healthy free-flowing rivers and recover wild salmon across the country (think the Elwha, White Salmon, Kennebec, Penobscot, Sandy, and Rogue Rivers) – and you want to see more – please read on. First, the good news: salmon get a political champion. Every so often – even in our currently highly polarized political climate – elected-leaders work to rise above the fray and seek new, collaborative solutions to tough challenges. This news is a game-changer – a tremendous addition to the growing national support for a new direction in wild salmon and steelhead policy. Restoring imperiled wild salmon and steelhead in the Columbia-Snake Basin – once the most abundant salmon watershed in the world – has proven elusive for more than two decades. Salmon and fishing advocates have scored important victories to provide salmon more river-like conditions by “spilling” water over Snake and Columbia River dams during their migration to the ocean. This has provided a much needed boost for these populations in decline, but more is needed to truly recover healthy, abundant fishable stocks. That’s where the Oregon governor comes in. Please take a moment to thank Governor Kitzhaber and call for a new approach from the Obama Administration. The Governor’s leadership is a welcome sign of hope and a political game-changer for these endangered salmon and the scores of river and fishing communities that depend upon them. His announcement builds upon the support for Columbia-Snake salmon from across the country and echoes the advocacy and hard work from Patagonia and many hundreds of businesses nationwide, thousands of salmon and fishing advocates, the Nez Perce Tribe, and scores of members of Congress who have pointedly questioned the federal government’s cycle of failed and ultimately illegal salmon policies. People are ready to work together and solve this problem. Governor Kitzhaber’s announcement provides the political muscle to move us in the right direction. Again, please send a message of thanks to Governor Kitzhaber. 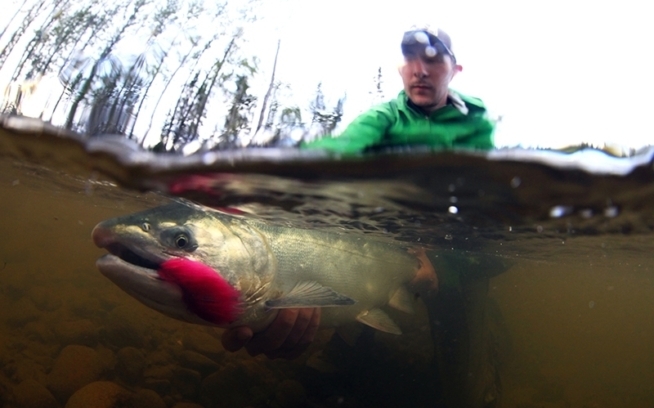 For more on these issues as they move forward, please visit us at Save Our Wild Salmon. Last month, just before Congress adjourned for their August Recess, Congressman Doc Hastings, Chair of the House Natural Resources Committee, introduced HR 6247, “Saving Our Dams and New Hydropower Development and Jobs Act of 2012.” If HR 6247 becomes law, we can all but say goodbye to decades of environmental protection and citizen involvement towards restoring rivers, recovering salmon, creating jobs and investing in local communities, and to more of the river restoration success stories that have recently captivated and inspired millions of people across the country. Please send a message opposing HR 6247 to your member of Congress. • HR 6247 would severely block federal funding to remove or to even study the removal of dams – even unsafe dams that the dam owner and the local community want to remove. • This legislation would prohibit federal funding for organizations and community groups that have engaged in legal actions against dam projects anywhere in the country, including litigation to protect public health and safety or help imperiled species like salmon. This would all but end the progress we’ve made for rivers, salmon, and communities through collaboration at local, regional, and federal levels. • HR 6247 would give blanket permission to private businesses to build new dams, without appropriate environmental and regulatory review – regardless of whether the projects serve the public interest. In many cases, taxpayers would actually foot the bill. Again, please take a moment to send a letter to your representative. Even if HR 6247 never becomes law, advocates are very worried that some its egregious provisions could suddenly appear in other legislation moving through congress. That’s why your legislator needs hear from you now. Bobby Hayden hails from Appalachia but has called the Pacific Northwest home for many years. An avid outdoorsman and musician, he’s worked for Columbia-Snake River salmon restoration for 6 years and believes both fish and people need to keep it wild.